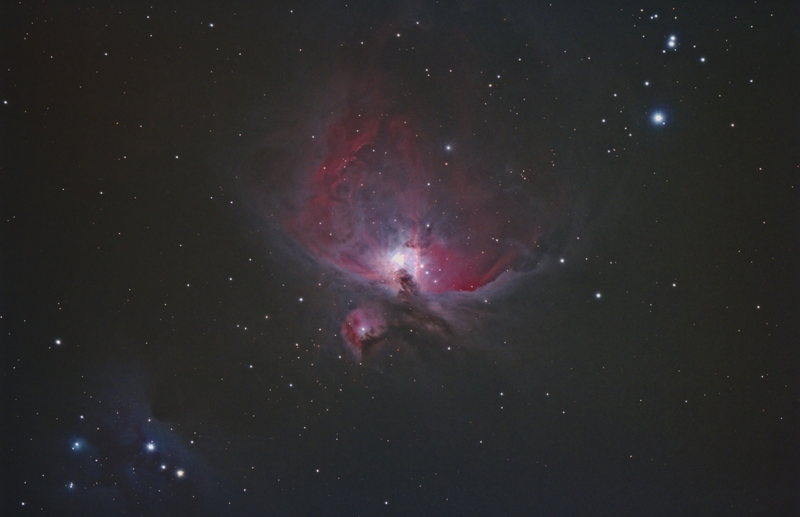 This is the first light image from my new SkyWatcher refractor. It is an urban image taken under bright skies and is a short exposure to test for flares on the stars. The scope produces pinpoint stars edge to edge with no hint of false colour. The image below has not had any star reduction or calibration applied thanks to the on-sensor dark current suppression of my Canon 60Da and the very flat field of the Esprit 120. No sharpening has been applied as the image is only a four minute exposure and the background has had noise reduction applied. Processing This image was processed entirely in Images Plus. No calibration was used. The image was brightened using a LMS combine of two arcsinH stretched versions, one to get the core detail and one for the faint outer areas. Masked noise reduction applied to the background using a frequency domain lowpass filter and the multipoint background flatten tool used to remove the light pollution gradient. No sharpening or star reduction has been applied to the image.